A pressure washer is a machine that needs to be handled and used properly. There are some instructions that you need to follow to get maximum benefit from it. Each and every pressure washer has its own and unique using guide to use it. Though the user guide of every machine is different, most of them follow the similar instruction. In this article, You will find the best tips on how to use a pressure washer properly. Step One: Unpack your machine and take it out from the box. Assemble your machine by following your user guide. If it is an electric pressure washer, then connect the power cord in its proper place. Connect the high-pressure hose with one side of the pump and on the other side connect the one side of the garden hose. Connect the other side of the garden hose to the water supply. Attach your spray gun with the other side of the high-pressure hose. Add your desired spray nozzle on the top of your spray gun. For gas pressure washer you must fill the tank with the fuel. Now your pressure washer is ready to use. Step Two: Connect the power cord of your machine to the electric outlet in your house. Electric pressure washers are designed in such a way so that you can use it to the normal electric power that you use at home. You should switch on the switch after plugging the cord in into the outlet; it is for your safety. After connecting switch on the power switch on your machine, pull the starting string to start the engine. Step Three: Now you open the switch of your water supply. Before you apply your water pressure on the dirty surface, spray the water on the other side. In the beginning, you will not get the proper water supply. Don’t be confused as it happens because in the beginning the pump doesn’t contain any water. When you get your desired water pressure washer, apply it on the dirty surface and clean it. Step Four: To change the nozzle stop your spray gun, remove the nozzle, connect the new nozzle. Hold your spray gun firmly as it might slip from your hand and might hurt you or the others. Keep the spray gun ten to twelve inches above the surface when you are spraying the water. Spray the water from one side to another slowly and repeat the same to cover the entire area. In this way, your cleaning will be very effective rather than spraying the water abruptly. Use the 0-degree nozzle to clean the corners. Step Five: After you have cleaned your surface nicely it’s time to keep your machine properly in your store-room. First, remove the garden hose from the water supply and spray the water for some more time. This will help you to take out all the remaining water from the pump and empty it properly. It is very important to empty your pump and keep. Now remove all the components and put the hose and power cord on the storage provided on the machine. 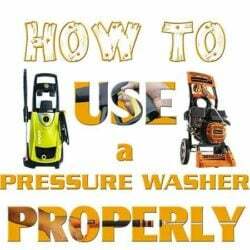 Dry your machine and empty your fuel tank, in the case of a gas pressure washer, if you are not going to use it for a long time. O-degree: This is the red color nozzle. You can use it to clean the corners, between the tiles, or very tough dirt, etc. 15-degree: This is a yellow color nozzle. This one can be used for floors, driveways, walls, drains, etc. 25-degree: The color of this nozzle is green. To clean your patio, cars, boats, etc. you can use this one. 40-degree: This is a white color nozzle. This will help you to clean the sidings of your house, stucco walls, etc. 65-degree: Black is the color of this nozzle. The surface that needs less water pressure is the proper place for using this nozzle. Soap Nozzle: To apply soap on a surface this nozzle will help you. By following the above steps, you can clean your dirty area properly, and your cleaning will be very effective. If you are a new user, you must read the user guide when you buy the machine first. Having good knowledge about your own device will always benefit you. In all the spheres of your usage, you can easily know the small problems that you face.